Abstract: This article presents various ways of measuring the popularity or market share of software for analytics including: Alteryx, Angoss, C / C++ / C#, BMDP, Cognos, Java, JMP, Lavastorm, MATLAB, Minitab, NCSS, Oracle Data Mining, Python, R, SAP Business Objects, SAP HANA, SAS, SAS Enterprise Miner, Salford Predictive Modeler (SPM) etc., TIBCO Spotfire, SPSS, Stata, Statistica, Systat, Tableau, Teradata Miner, WEKA / Pentaho. I don’t attempt to differentiate among variants of languages such as R vs. Revolution R Enterprise, or SAS vs. the World Programming System (WPS) or Carolina, except when it is particularly easy such as comparing the company Pagerank figures. These packages are all included in the first section on jobs, but later sections are older (each contains a date) and do not cover an as extensive set of software. I’ll add those as I can and announce the changes on Twitter where you can follow me as @BobMuenchen. When choosing tool for data analysis, now more broadly referred to as analytics, there are many factors to consider. Does it run natively on your computer? Does the software provide all the methods you use? If not, how extensible is it? Does that extensibility use its own language, or an external one (e.g. Python, R) that is commonly accessible from many packages? Does it fully support the style (programming vs. point-and-click) that you like? Are its visualization options (e.g. static vs. interactive) adequate for your problems? Does it provide output the form you prefer (e.g. cut & paste into a word processor vs. LaTeX integration)? Does it handle large enough data sets? Do your colleagues use it so you can easily share data and programs? Can you afford it? Job Advertisements – these are rich in information and are backed by money so they are perhaps the best measure of how popular each software is now, and what the trends are up to this point. Published Scholarly Articles – these are also rich in information and backed by significant amounts of effort. Since a large proportion come out of academia, the source of new college graduates, they are perhaps the best measurement of new trends in analytics. Books – the number of books that include a software’s name in its title is a particularly useful information since it requires a significant effort to write one and publishers do their own study of market share before taking the risk of publishing. However, it can be difficult to do searches to find books that use general-purpose languages which also focus only on analytics. Blogs – the number of bloggers writing about analytics software is an interesting measure. Blog posts contain a great deal of information about their topic, and although it’s not as time consuming as a book to write, maintaining a blog certainly requires effort. What makes this measure particularly easy to gather is that consolidators like Tal Galili have created blog consolidation sites like R-Bloggers.com which make it easy to count the blogs. Previously that had been a difficult task. Web Site Popularity – how does Google provide the most popular search results at the top of its response to your queries? A major component of that answer comes from the total number of web pages that point to any given web site. That’s known as a site’s PageRank. This is objective data, and for sites that clearly focus on analytics, it’s unbiased. However, for general-purpose software like Java, many sites that discuss programming point to http://www.java.com, and probably fewer that discuss analytics point to it as well. But it may be impractical to tell which is which. Surveys of Use – these add additional perspective, but they are commonly done using “snowball sampling” in which the survey taker tries to widely distribute the link and then vendors vie to see who can get the most of their users to participate. So long as they all do so with equal effect, the results can be useful. However, the information is often low, because the questions are short and precise (e.g. “tools data mining” or “program languages for data mining”) and responding requires but a few mouse clicks, rather than the commitment required to place an advertisement or publish an article. Programming Activity – some software development is focused into repositories such as GitHub. That allows people to count the number lines of programming code done for each project in a given time period. This is an excellent measure of popularity since writing programs or changing them requires substantial commitment. Discussion Forums – these web sites or email-based discussion lists can be a very useful source of information because so many people participate, generating many tens of thousands of questions, answers and other commentary for popular software and virtually nothing for others. Popularity Measures – some sites exist that combine several of the measures discussed here into an overall composite score or rank. In particular, they use programming activity and discussion forums. IT Research Firms – these firms study the analytics market, interview corporate clients regarding how their needs are being met and/or changing, and write reports describing their take on where each software is now and where they’re headed. Sales or Download Measures – the commercial analytics field has undergone a major merger and acquisition phase so that now hard to separate out the revenue that comes specifically from analytics. Open source software plays a major role and even the few packages that offer download figures are dicey at best. Growth in Capability – while programming activity (mentioned above) is required before growth in capability can occur, actual growth in capability is a measure of how many new methods of analysis a software package can perform; programming activity can include routine maintenance of existing capability. Unfortunately, most software vendors don’t track this measure and, of course, simply counting the number of new things does not mean they are widely useful new things. I have only been able to collect this data for R, but the results have been very interesting. One of the best ways to measure the popularity or market share of software for analytics is to count the number of job advertisements for each. Indeed.com is the biggest job site in the U.S. making its sample the most representative of the current job market. As their CEO and co-founder Paul Forster stated, Indeed.com includes “all the jobs from over 1,000 unique sources, comprising the major job boards – Monster, Careerbuilder, Hotjobs, Craigslist – as well as hundreds of newspapers, associations, and company websites.” To demonstrate just how dominant its lead is, a search for SPSS (on 2/19/14) showed more than ten times as many jobs on Indeed.com as on its well-known competitor, Monster.com. Indeed.com also has superb search capabilities and it even includes a tool for tracking long-term trends. 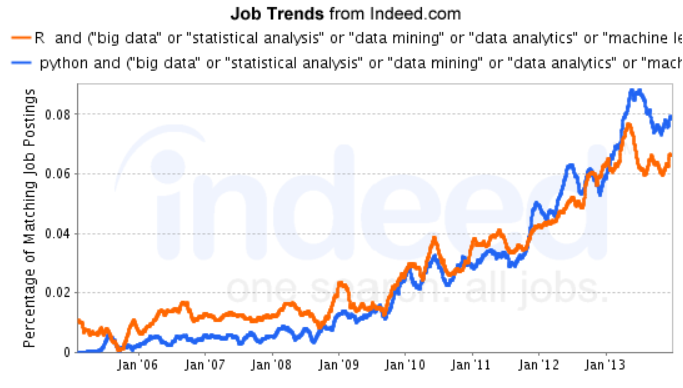 Searching for analytics jobs using Indeed.com can be easy, but it can also be very tricky. For many of the analytics software that required only a simple search on its name. However, for software that’s hard to locate (e.g. R) or that is general purpose (e.g. Java) it required complex searches and/or some rather tricky calculations which are described here. All of the graphs in this section use those procedures to make the required queries. Figure 1a shows that Java and SAS are in a league of their own, with around 50% more analytics jobs than Python or C, C++/C# and twice as much as R. (The three aforementioned C variants are combined in a single search since job advertisements usually seek any of them). Python and C/C++/C# come next at an almost identical level of popularity. That’s not too surprising as many advertisements for analytics jobs that use programming mention both together. Figure 1a. The number of analytics jobs for the more popular software (2/2014). R resides in an interestingly large gap between the other domain-specific languages, SAS and SPSS. This is the first estimate I’ve done that shows that the job market for R has not only caught up with SPSS, but surpassed it by close to double the number of job postings. I knew my previous estimates for R jobs was low, but I had not yet thought of a better way to estimate the total. From SPSS on down, there’s a smooth decline. Enterprise Miner is the only data-mining-specific software to make the cutoff of at least 100 jobs. If I plotted all the software below that point, they would all pile up on the y-axis, appearing to have almost no jobs. Relatively speaking, they don’t! Software that did not make that cut and are not displayed on the graph are: Alteryx (68), Statistica (67), RapidMiner (38), SPSS Modeler (36), KXEN (28), KNIME (26), Julia (15), Statgraphics (11), Systat (10), Angos (6), Lavastorm (5), NCSS (4), Salford SPM etc. (3), Teradata Miner (2) and Oracle Data Mining (2). It’s important to note that the values shown in Figure 1a are single points in time. The number of jobs for the more popular software do not change much from day to day, but each software has an overall trend that shows how the demand for jobs changes across the years. 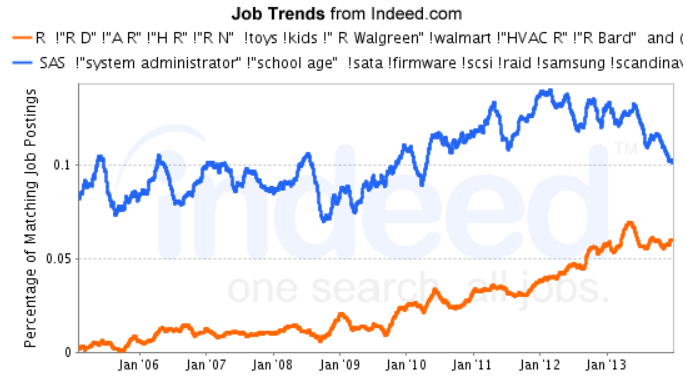 You can plot such trends using Indeed.com’s Job Trends tool. However, as before, focusing just on analytics jobs requires carefully constructed queries, and when comparing two trends at a time means they both have to fit in the same query limit allowed by Indeed.com. Those details are described here. I’m particularly interested in trends involving R, so let’s look at a couple of comparisons. Figure 1b compares the number of analytics jobs available for R and SPSS across time. Analytics jobs for SPSS have not changed much over the years, while those for R have been steadily increasing. The jobs for R finally crossed over and exceeded those for SPSS toward the middle of 2012. Figure 1b. 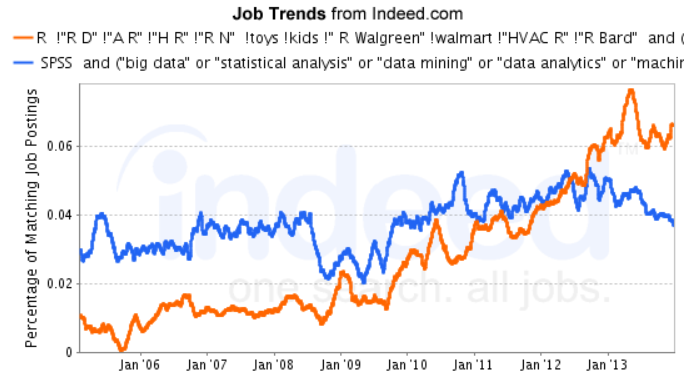 Analytics job trends for R and SPSS. Note that the legend labels are truncated due to the very long size of the query. 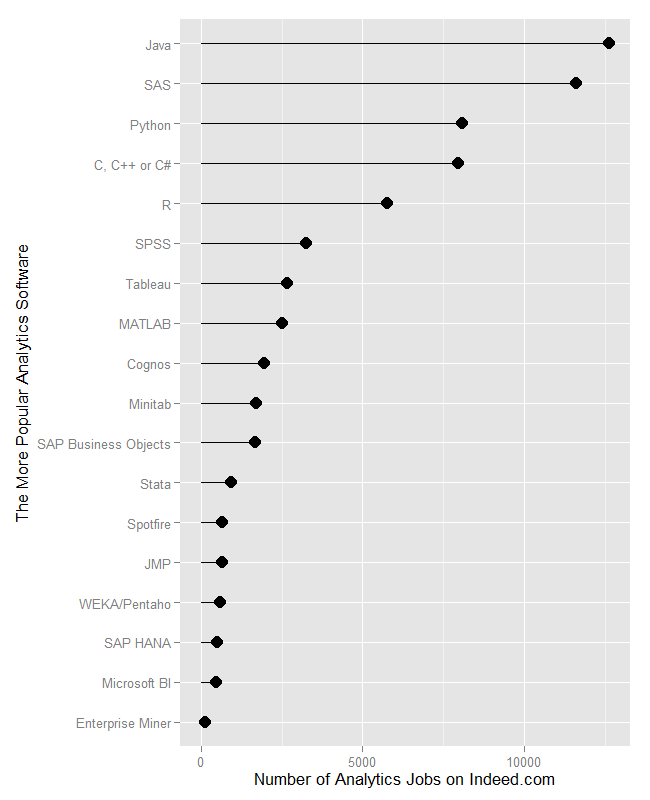 We know from Figure 1a that SAS is still far ahead of R in analytics job postings. How far does R have to go to catch up with SAS? Figure 1c provides one perspective. It would be nice to have the data to forecast when R’s growth curve will catch up with SAS’, but Indeed.com does not provide the raw data. However, we can use the approximate slope of each line to get a rough estimate. If jobs for SAS stay level and those for R continue to grow linearly as they have since January 2010, then R will catch up in 3.35 years. If instead the demand for SAS jobs that started in January of 2012 continues, then R will catch up in 1.87 years. Figure 1c. Analytics job trends for R and SAS. Legend labels are truncated due to long query length. A debate has been taking place on the Internet regarding the relative place of Python and R. Ironically, this debate about softare to do data analytics has involved very little actual data. However it is possible now to at least study the job trends. Figure 1a showed us that Python is well out in front of R, at least on that single day the searches were run. What has the data looked like over time? The answer is in Figure 1d. Figure 1d. Jobs trends for R and Python. Legend labels are truncated due to long query length. Note that in this graph, Python appears to have a relatively slight advantage while in Figure 1a it had a huge one. The final point on the trend graph was done only two days after the queries used in Figure 1a, and that data changed very little in the meantime. The difference is due to the fact that Indeed.com has a limit on query length. Here is the query used for Figure 1c, and the analytic terms it contains were fewer than the one used for Figure 1a.
! "R D" ! "A R" ! "H R" ! "R N"
The detailed description regarding the construction of all the queries used in Figures 1a through 1c is located here. At this point, the rest of The Popularity of Data Analysis Software will continue, offering many additional perspectives on measuring analytics market share. However, until I update those sections in the coming months, they will not cover as broad a range of software. Stay tuned on Twitter, by following @BobMuenchen. If you know SAS, SPSS or Stata and have not yet learned R, you can join me for this web-based workshop aimed at translating your knowledge into R. The next workshop begins on April 21. If you do know R and would like to learn more, you might enjoy taking Managing Data with R. The next time I’m offering that is on April 25.